The information presented on this page was originally released on April 22, 2004. It may not be outdated, but please search our site for more current information. If you plan to quote or reference this information in a publication, please check with the Extension specialist or author before proceeding. Sometimes when a plant gets labeled a noxious weed my first thought is that the most negligent gardeners, even someone like me, can grow it. Since I am on the road constantly, I need tough plants and one of the hardiest varieties that I adore is the Ox Eye daisy. The Ox Eye is known botanically as Leucanthemum vulgare and is related to the highly esteemed Shasta daisy with the botanical name Leucanthemum x superbum. 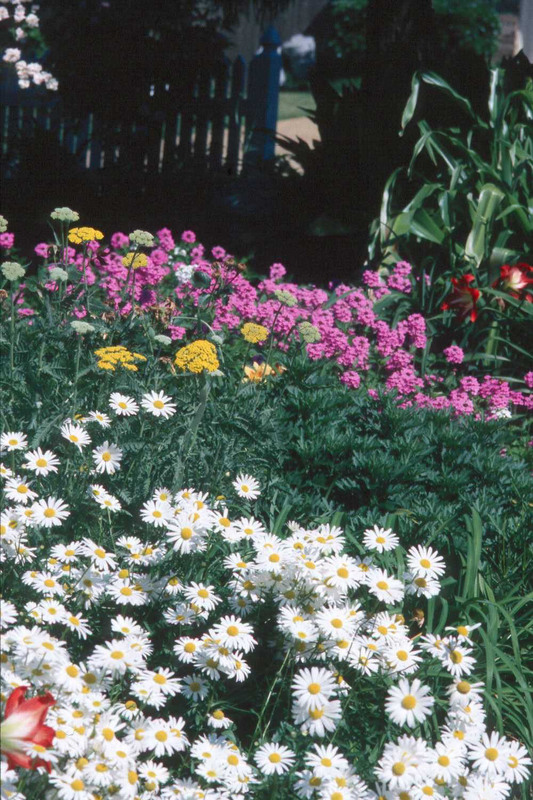 Some communities plant Ox Eye daisies for color in high-traffic areas. When you see a plant growing and blooming beautifully in the highway medians, you can be sure it's tough. The Ox Eye seems to be blooming everywhere now mostly in older gardens as sort of a precursor to the Shasta daisies like last year's perennial plant of the year, Becky. The best of all worlds would be to have the Ox Eye daisy blooming now and give way to weeks of Shasta blooms. Your neighbors would surely get testy as they figured you had more than your share of daisies blooming. After all, daisies are among the most treasured perennial in the landscape. The lowly Ox Eye originates in Eurasia and is a reliable perennial from zones 3 to 9. It does have a slight wildflower look to it and indeed it can spread aggressively. Plant your Ox Eye daisies in full sun or where they get at least six hours of morning sun. They do best in fertile, well-drained soil, though I'll be the first to admit I have seen some blooming up a storm in soil better suited for dynamite. Do yourself a favor and incorporate three to four inches of organic matter and work it in 6 to 8 inches. While tilling, add 2 pounds of a slow-release fertilizer per 100 square feet of planting area. A blend like 12-6-6 or balanced 8-8-8 with minor nutrients would be super. Space plants 12 to 15 inches apart, planting at the same depth they are growing in the container. Keep the flowers deadheaded for a tidy look and make thinning or managing the spread part of your regular routine. After they have finished blooming, cut them back by half. Division for both the Ox Eye and the Shasta daisies is best done in the fall and will improve your blooming and vigor substantially. The Ox Eye makes a nice companion with old-fashioned larkspurs, verbenas, coreopsis, yarrow and Victoria Blue salvia, a Mississippi Medallion winner from a few years ago. They can combine to make a nice, modern cottage-style look. They will probably be harder to find than a four-leaf clover and that may prompt you to get starter plants from a neighbor down the street. The variety May Queen is the most recognized in the trade. But as you shop for them, pick up a flat of the Becky Shasta daisy and follow the same planting recommendations. Also pick up the companion plants mentioned above.